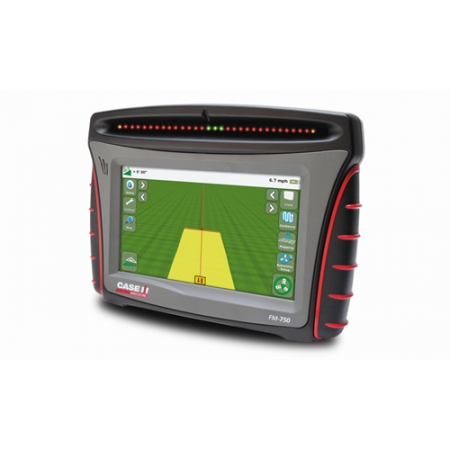 The FM-750 display is a multi functional precision agricultural display with an integrated GPS/GLONASS receiver capable of a wide range of accuracy levels. It can be used in conjunction with a Case IH guidance ready machine as well as many other makes and models for automated steering. Products such as AutoPilot, EZ-Pilot™, EZ-Steer, Field IQ and others utilize the FM-750 display. Manual guidance for a number of field patterns, or add hands-free guidance with the EZ-Steer, EZ-Pilot™, or Autopilot™ steering systems. Field-IQ™ crop input control capabilities, including seed monitoring, 2-product variable rate application control, boom height control, and automatic section control.